We seem to love Scandinavian games here at Nintendo Life. We began our glowing SteamWorld Dig review last month by espousing the virtues of the Swedish indie gaming scene, but Sweden's neighbour to the west is not to be forgotten: hot on the heels of SteamWorld comes Teslagrad, an equally impressive Metroidvania-style puzzler by Norwegian studio Rain Games. Teslagrad and SteamWorld Dig open in surprisingly similar fashion – both feature a title screen with evocative music and the name of the game in large letters above a small character walking from left to right in the centre of the frame. Both are full of immaculate hand-drawn 2D artwork with gorgeous animation and a steampunk-inspired gameworld, but while SteamWorld Dig chose a warm colour palette for a humorous Western adventure, Teslagrad utilises deep shades of blue for a decidedly more sombre tale. From there, Teslagrad's title screen moves directly into the opening scene of the game uninterrupted, which brings to mind Jonathan Blow's modern classic Braid; unlike Braid's lugubrious walls of text, however, Teslagrad tells its story entirely without words. It's much more similar to another Scandinavian platformer about a young boy: the haunting Danish puzzler Limbo, using a minimalist approach to tell a poignant story. Teslagrad opens in medias res with one of the best video game chase scenes in recent memory; it's a rainy night somewhere in Eastern Europe, and a group of burly men have come to seize a family from their home. A little boy – the player's character – emerges alone from the back door of the house, and from there you must escape the attackers. Why are you being chased? Is the boy a young Nikola Tesla? No context is provided until much later; for now, all we know is the boy must escape. The boy has no powers or special abilities to begin the game, so all he can do is run across rooftops and evade the angry men giving chase. During this scene we get to see the town of Teslagrad for the first time, a run-down city with an imposing skyscraper towering in the distance. This scene highlights the game's gorgeous parallax scrolling, not only with the background but with objects in the foreground, like walls plastered with propaganda or a stray cat running by. 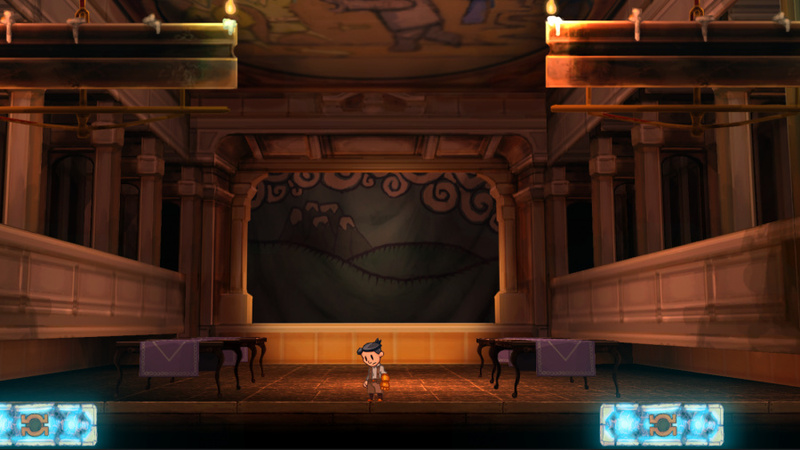 Teslagrad's nostalgic old European art style and music are like a melancholy Professor Layton, if the Professor grew up in Serbia rather than England. 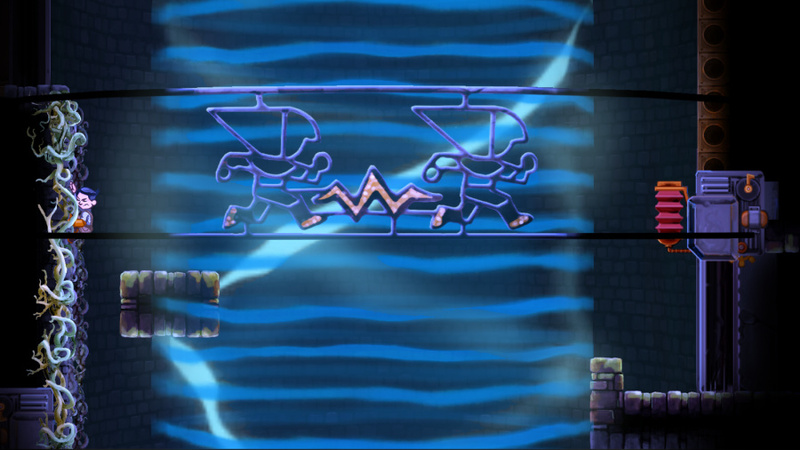 Through environmental storytelling, we learn a lot about the world of Teslagrad during this opening scene. The chase moves from a residential area to a seedier neighbourhood and through a hotel (a nod to Limbo's hotel?) to a more industrialised district full of smoke and pollution, before the burly men chase the boy into an ominous castle with a drawbridge that closes behind him in classic Castlevania fashion. Then the main game begins. We can't say enough good things about this opening scene – it should be studied in schools. Rain Games subverts our expectations of this slow, moody game by beginning with a frantic chase sequence, and it absolutely nails "show, don't tell" storytelling through the environment and the characters' interactions with each other. No exposition, no dialogue, no tutorial, no UI to speak of. The only controls needed for this are the left control stick and the B button for jumping. We're immediately immersed in the game world and invested in this protagonist who we know next to nothing about – and we're dying to find out more about him. Once we get into the meat of Teslagrad, it becomes a non-linear Metroidvania experience with a focus on puzzles rather than action; the heartbreakingly beautiful environments are meticulously detailed with tons of secrets and collectibles to come back to later. 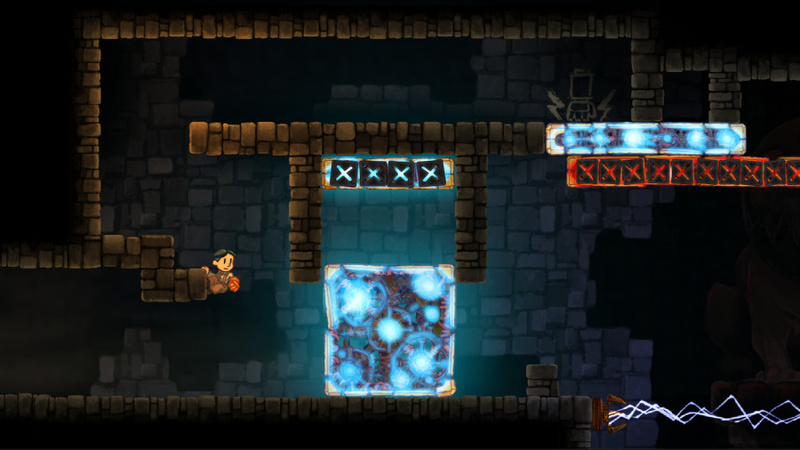 As its name implies, Teslagrad is all about alternating current electricity, and the core game mechanic revolves around red and blue electromagnets: magnets of opposite colours attract each other, and magnets of the same colour repel each other. The boy gains the ability to use these magnets with environmental objects, with the L buttons for blue magnets and R for red – you'll have to do things like use magnetism to make blocks fly across the room or to propel the boy himself to previously unreachable platforms. New mechanics like magnetic cloaks and the ability to "blink" across gaps Dishonored-style are introduced slowly, never overwhelming players with too much information at once. 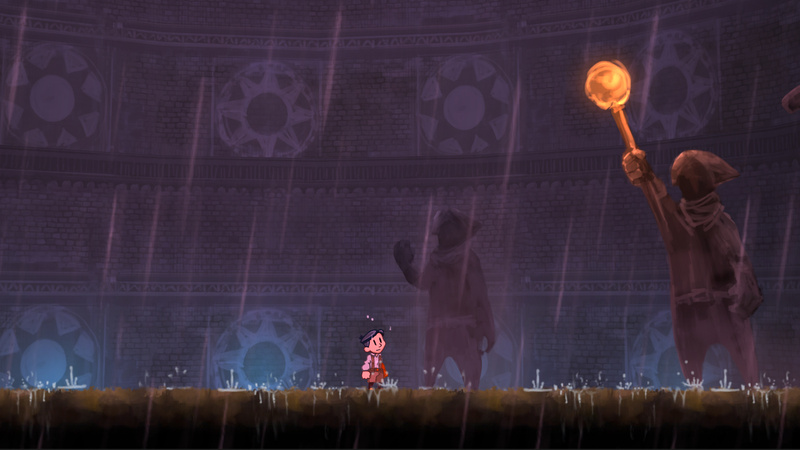 There's no health system in Teslagrad, as the boy immediately dies with a single hit. To make up for this, he has unlimited lives and always immediately respawns at the entrance of the room you died in. This is welcome news, because Teslagrad becomes infernally difficult as the story progresses, with some truly cranium-melting puzzles and zero hand-holding to be found anywhere. You'll find yourself replaying the puzzle-fight boss battles dozens of times before you figure out how to defeat them without taking a single hit, which will turn off more casual players but provides an old-school challenge for platforming veterans. 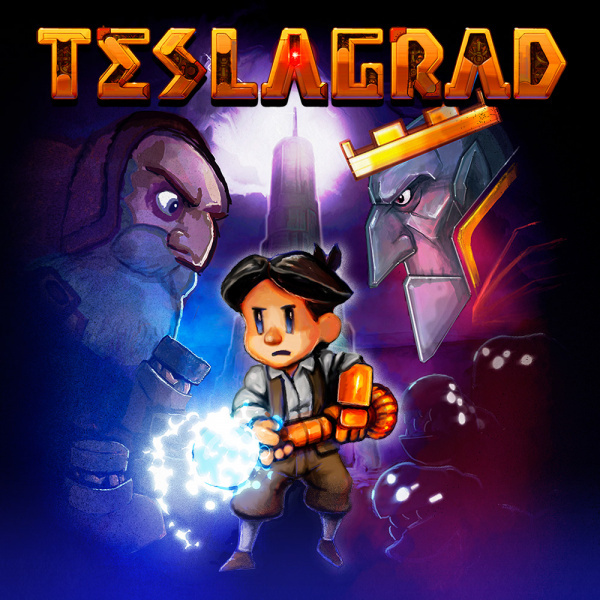 As the story unfolds we also find out more about the history of Teslagrad. Environments get bigger and stranger, and scattered throughout the mysterious castle are auditorium rooms, where paper theatre sequences tell the story of a kingdom torn apart by the corrupting power of electricity. You're not required to sit through these performances, so if you want you can simply run past these rooms to the next puzzle, but if you stick around you'll be rewarded with a more fleshed-out gameworld. This elegantly-told saga of a broken industrial city falling into ruin juxtaposes and parallels the deeply personal story of the boy, adding a heavy emotional punch to what is ostensibly a game about magnets. On default settings, gameplay is displayed on your TV screen while the GamePad is used as a handy map; there's no Pro Controller support, but Teslagrad supports off-TV play so you can Tesla on the toilet. There is a bit of slowdown when loading new areas or particularly large rooms, but for the most part the game runs at a steady frame rate with tight controls. It's also worth noting there's a plethora of language options: in addition to English, Teslagrad supports Chinese, German, Spanish, French, Italian, Dutch, Norwegian, Polish, Brazilian Portuguese, European Portuguese, Slovak, Serbian, Russian, Turkish, and Ukrainian. A fittingly Eastern European collection of languages! 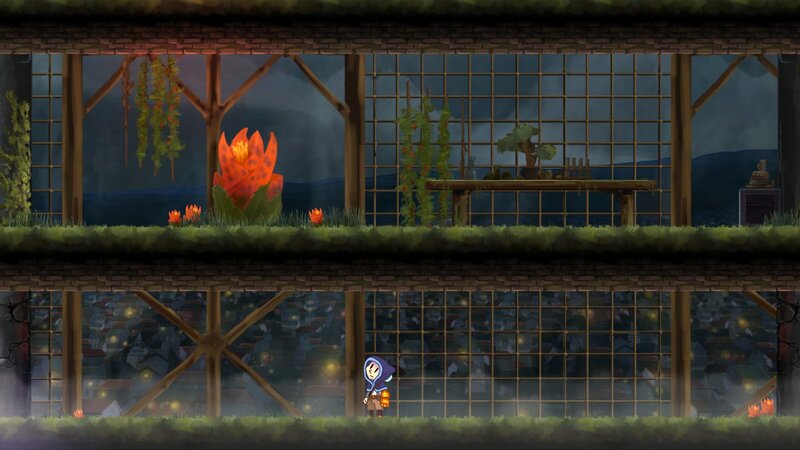 Teslagrad is everything we love about download gaming on Wii U. From the flawless opening scene to the nostalgic music to the luscious hand-drawn artwork to the brain-bending puzzles, Rain Games has a certified hit on its hands. The extreme difficulty will be hard for some to swallow, but it never feels unfair; anyone who appreciates an old-school challenge will find something to enjoy here. If you've finally torn yourself away from SteamWorld Dig, Teslagrad is the worthy heir to the Scandinavian throne. Pretty juiced to play this. Amped, even. Everything I was hoping for and then some. Can't wait to dl this in just over 2 hours! Glee!!!! oh wow! will pick it up, but probably at a later date with hyrule warriors coming in soon. @JakeShapiro I know it shouldn't matter but how long did it take you to beat and is there any reason for a second play through? I'd say you sound pretty electric about this game. I was grounded at first myself, but now I might consider it because of its buzz. @ajcismo Really can't wait to see watt this has in store. Hopefully a battery of awesome mechanics and puzzles to charge in to. I'm glad to hear it's as good as it looked, with no real problems. I won't be getting it right now, but I'll definitely add it to my wishlist for later. Wow nice. I like all this language support I faintly hope this is a sign of things to come, but I highly doubt it though. I have just spent $15 on Shovel Knight, $10 on SteamWorld Dig, $5 on Scream Cat, $12 on Wii Sport Club, $4 for Mario 3... another $15 is hard for me to swallow. Oh yes. Been keeping my eyes on this one for a long time now. Will definitely get it as soon as I get home tonight. @GreatPlayer took me probably 5-6 hours to beat it. That being said I got stuck on a few of the trickier puzzles and boss fights so if you're a more skillful player it can be done quicker. Also it depends on how much you want to explore, if you want to get all the scrolls it might take 8 hours-ish. Its completely worth buying though. Sweeeeet! I've been looking forward to this more so than Hyrule Warriors. Ever since the "Dark Souls is so hard" ridicule (since that's just a lie), I'm having a hard time believing such claims for any game - I'll see if I'm gonna get, probably not though. Very interested, but not looking for a game right now. Definitely adding this to my wishlist for future purchase though. definitely looking for a new game during the wait for hyrule warriors. It comes down to teslagrad or azure striker gunvolt for 3ds. "The extreme difficulty will be hard for some to swallow"
Anybody at NL working on a Cubemen 2 review? The game looks right up our alley - TD, level creator, multiplayer - but something about iOS games ported to consoles makes me nervous. @NImH Thanks! I appreciate the support. @Spoony_Tech I'd say @TylerTreese is right, about six hours depending on how you play. Not quite as much replay value as some other Metroidvanias, but the game is so gorgeous you'll want to experience it again anyway. @JakeShapiro Thanks for the reply. @rjejr Can't speak for NintendoLife staff but I liked Cubemen 2 a lot. Very strong multiplayer game although i'm not sure how active the online community is right now as I haven't played much since reviewing. Single player is fine but I got more enjoyment out of playing with others. It controls fine for the most part after you adjust to it, occasionally I would hit the wrong block but you can use the analog sticks to fine-tune the camera so its just a 1-2 second adjustment at worst. Scandinavia is good at making games. Like I already said: nearly half the price on Humble Store and DRM free and multiplatform. Get a grip Nintendo. Paying full price for this to support the dev. Not too keen on one hit kills during boss fights, though. Nice, I can't wait to pick it up later today. SteamWorld Dig has been getting all my attention. Looks and sounds absolutely immense, getting it for sure. You don't PLAY in these kinds of worlds. You just solve a bunch of puzzles one after the other. Once you get to the puzzle bits it becomes clear it's just another series of generic tiles and blocks and platforms and switches placed around various rooms, like the hundreds of other generic indie puzzle-centric platform games we see these days but in a slightly different skin... That's not a truly compelling game world I actually want to be in and mess around around in discovering all it's little corners and secrets. To me, it's just going through the motions because I need to beat the next puzzle section to progress. It's a glorified puzzle game in disguise as a platformer and when I see what looks like a platformer I actually want a platformer. I have no issue with there being some puzzles and stuff but I'd rather it feel more like a convincing fun world I'm running around first, with some (a few) puzzles that would logically fit into that world as and when they make sense and add to the experience of being in the world and the overal atmosphere and story etc. If they'd just had the courage to make the whole game in the same way they made that first section, basically like a traditional platformer (more about your gaming skill, hand eye co-ordination, navigating the character through world, platforming timing, exploring and discovering secrets, playing around in the world, etc, rather than it basically being about your puzzle solving skill), then I think it could have been something really special. Lastly, there needs to be some noise coming from both the main character and the other characters when the jump and climb, when enemies spot you and give chase and so on (maybe grunts, shouts and stuff), because it feels like it's actually missing some of the sound fx otherwise imo (other than the sound of the characters footsteps), for whatever reason (possibly convention). Ultimately, it looks good for what it is (one of a thousand other indie puzzle-centric platformers), but I think it could have been so much more. @TylerTreese - "It controls fine for the most part after you adjust to it, "
Yeah, this is why I'ld like demos of games like this, to see if we - the boys and I - can adjust. I already think open world real time strategy will be a stretch for them. They love Swords and Soldiers and Advance Wars and Plants vs Zombies, but Pixeljunk Monsters was even a bit much for them. Though that was a few years back. I'll probably get it, but don't want to buy it and have a review score of 3 come out the next day. I was going to get this game anyway, but great review! Does anyone know if Teslagrad also is a 1080p game, like Steamworld dig was? @rjejr Please note that Cubemen 2 only has online multiplayer. To me, that's unfortunate, since local multiplayer like Swords & Soldiers HD would be lots of fun. The mode I like the best is the new Wii U-specific mode, where a defeated unit turns to the other team. Sounds awesome but £13.99 is too much for me right now with all the other games I want, I'll get it eventually or when it is on sale. @TylerTreese What is your avatar from? Because I'm pretty sure I had a nightmare about a guy who looked just like that, exact same mask and all. @Desy64 I understand what you're saying but I'd pay 3 times that for a retail release that might last 24-30 hours so to me, if the quality is there it seems about ok, if not huge. I've had the pleasure of playing this game for a few hours and it deserves to be mentioned in the same breath as braid and limbo its that good. This game just gonna hit the backlog, way to many other games to save up for. @Andyjm it's just a matter of priorities, money I mean...I spent 7 bucks in Steamworld and was pissed it lasted a weekend. Then I thought, ok not that expensive. For 15 bucks I can get a 2nd-hand big game and that's the reality nowadays. Does anyone know how big the download is for Teslagrad? @Kirk it gets a lot less puzzly once you start using the blink boots! Sounds like it will be every bit as good as SteamWorld Dig and if that is the case, it will surely be an amazing game! I will get it next week, together with Hyrule Warriors. A 9 is a really good score and we need as many Indie games as possible, especially if they are as fleshed out as this one. @mid_55 Ha, I have made the exact same Mario Golf complaints on here multiple times. I actually commented about that conversion for this game a short while ago on a teslegrad related article and the dev got back to me, can't remember what they said, I'll have a look for it. the price difference is mainly to pay for six months of porting and bug fixes (unity simplifies the process but it's by no means a one button process), not to mention age ratings for every region, which is obligatory for console releases and can get pretty costly. nintendo recommends healthy pricing practices. Not going to elaborate too much on this, but the race to the bottom and "not buying till it's 75% off" trend in pc game pricing is pretty bad for indies." I appreciated the response and am more than happy to pay £13.99 for a quality game. Wish there was pro controller support. My gamepad hasn't been working right. Another title to add to the ever expanding list of games I want to buy. Great review this game deserves that score. Looking forward to this. Now I just need some free time. Yaaay! I was sold already but I'm delighted to hear you were fans as well. @TylerTreese Thanks! I'll probably wait for a sale. @jariw - Online only? Oh man, thanks for the heads up. Im so used to Ninty games lacking online thst it never even occurred to me this wouldnt have offline coop or vs. Guess its back to waiting for S & S 2. If it wasn't more expensive than the Steam version i would have downloaded right now. "Not going to elaborate too much on this, but the race to the bottom and "not buying till it's 75% off" trend in pc game pricing is pretty bad for indies." This is part of a response someone from the dev team wrote to a question I posed about NA/EU conversion rates. Of course we all have a certain amount of money, and most of us need to be thrifty, but I think the game is worth the current price tag on wii u. We should support developers creating, what I wouldn't hesitate to call, beautiful content if we can possibly afford to. I for one don't want a games industry with nothing but the current batch of "AAA games." Apologies if you really can't afford the current price but if you can i think you should go for it. What is with people using the analogue stick over the D-pad when playing sidescrollers? It makes zero sense to me. "Tesla on the toilet"... I'm done! @luke88 I understand what you are saying, but do you notice that Wii U games are increasingly unlikely to have demo? I often purchased a game that I do not play because the game did not have demo (e.g., Scream Kitty and Toki Tori 2). These games are by no means bad and someone would love these games. Just I would not play them. I just do not want to pay a full price for a game that I would regret after playing it for a few minutes. By all accounts, and for obvious reasons, it's difficult for 'indies' to incur further expense by getting a demo together. Obviously there are bad games out there or games that don't suit our own tastes but that's always been the case. I guess that's what reviews are for? I know that's not the same as a demo though. My point was really a personal one I guess; I'm happy to pay full price for a game because I think games, good ones, are worth what we pay for them. I also believe the industry is currently being given so much by independent devs in terms of unique and genuinely artistic experiences. These people deserve success, in my opinion, and if they are successful, and seen to be so, that can only be good for us in years to come; as I imagine more and more people will become willing to go out on a limb and try and bring 'that cool idea for a game' they've had in their heads into being. Looks and sounds great. I'll definitely download it someday when it gets cheaper (or I buy it at Retail, when that happens). Its also cool that Dutch is supported. I am a dutchman. Last month, it was revealed that Teslagrad would also have a physical retail edition released. Does anyone know the status of this ..... and possibly when? I really like what I have seen about this game but prefer to buy retail games (whenever possible). btw, we got a surprise email from ESRB this morning, they've reconsidered the Teen rating in the US. It'll take some time to get it updated across the board, but the new rating is E! @mid_55 Hi, sorry for late response. No problem man, I thought it was pretty interesting and deserved reposting. Yeah I definitely think it's worth the money but I'd hate for you to spend more on it based on my advice when you could of got it for less elsewhere, then regret spending so much on it. It's a beautiful game though. Ha! That's funny, I emailed Nintendo too and got, I imagine, the exact same generic response. I still haven't bought that game; it will be one of the only first party titles I pick up second hand for as little as possible. So no, I don't think you're sad, well actually, maybe we're both sad. But I think there's a difference between a multinational like Nintendo charging us more in the UK and an independent dev doing the same. i thought this might be another wonky concept indie game, but the mechanics are fun and the atmosphere just keeps you at it like metroid. great art, animation and sound design and the controls are very tight. once you get your head around the polarity mechanic you zip around like a nerdy super hero. I've been holding off buying this, since I have too many games to play. But I'm finally getting this in the sale on Thursday January 15th! Utilized the SUper Indie sale to pick this up. Looking forward to it. Love puzzle type games. I want to really like this but I am finding hard to see it as anything but just another Indie puzzle game. Maybe if I play it more I will start to like it.